The proportions of the Akbar table are wider and lower than the Tangier or the very popular Alexander, while the pointed and deeply scalloped arch gives it a bolder presence. Either on its own or paired with others, this table is the perfect spot to place a frosty Martini or a cup of rich Turkish coffee. 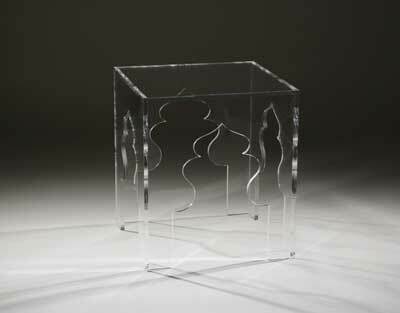 Made of ½” acrylic, the table measures 16” wide by 16” deep by 18” tall. Also available in smoke and white.